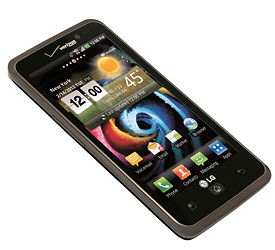 The LG Spectrum is a 4G LTE (700MHz) phone with dual-band EV-DO Rev. A (850/1900MHz) and 802.11b/g/n Wi-Fi. It also works as a 4G mobile hotspot for up to 10 devices simultaneously. On a rainy day in NYC, (which can sometimes affect data performance), I saw download speeds averaging 5 to 9 Mbps down and 6 Mbps to 9 Mbps up over LTE; we’ve seen download speeds as high as 16Mbps with another LG Spectrum. Voice quality was mixed, with a crisp tone in the earpiece and plenty of gain, although it distorted at the top settings. Transmissions through the mic were clear, with minimal street noise outdoors, although the tone was on the warm (read: slightly muffled) side. Reception was fine, but the phone heated up a bit during longer calls and while charging. The 8-megapixel auto-focus camera includes a single LED flash, and there’s also a front-facing 1.3-megapixel camera for video chats. Test photos looked sharp, detailed, and well balanced overall, with good resolution, if a slight grayish cast. Shutter speeds were fast at just 0.3 seconds in my tests. The auto-focus had some trouble with outdoor shots on a rainy day, but otherwise this is a good camera. Recorded 1080p (1920-by-1080-pixel) and 720p (1280-by-720-pixel) videos played smoothly at 29 frames per second.